John is a co director of Alpine Cadence and is ever present as chief guide for all the tours and camps throughout the season. He is a qualified Level 3 coach with the Association of Brithish Cycling Coaches. His passion for riding and racing takes him all over Europe and and John races every year in the Etape du Tour and many other major amateur events. Recent results include 5th place overall in the the 2017 Haute Route Pyrenees and 76th place in The 2017 Etape du Tour. He even has a world record to his name, the most vertical metres climbed on a bike in 12 hours, set on September 11th 2016 wnen he completed 9847m of climbing with multiple ascents of his local Montchavin climb. Carolyn is a regular cyclosportive rider and member of the Macot La Plagne Club. Her success in this male dominated sport has been impressive as is her cooking and hospitality at our chalet base in Bellentre. Carolyn is a regular guide on out trips and is currently pursuing her cycle coaching qualification with the ABCC. Carolyn has been involved with coaching skiing for many years in her native Australia as well as Europe and certainly won't hold back with any advice! Oliver is the second guide for most of our trips and provides plenty of friendly support and guidance to our riders. A very strong rider in his own right, Oliver finished 18th in the 2016 edition of Haute Route Pyrenees and given half a chance he'll always be searching for that sneaky KOM somewhere on a hill in Europe. 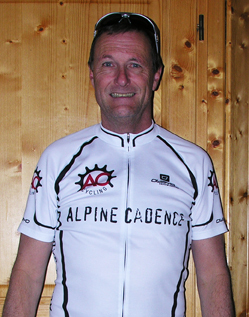 Martin is a passionate cyclist but fortunately for Alpine Cadence he's a passionate driver/support man too! Martin is always on hand to help with all the logistics of our trips. His knowledge of the area, mechanical knowledge,ongoing enthusiasm and ability to solve just about any problem is second to none. Martin has lived in the area for over 20 years and we're very lucky to have him on the team.